Wow, only a month to Christmas and the festivities have started already. 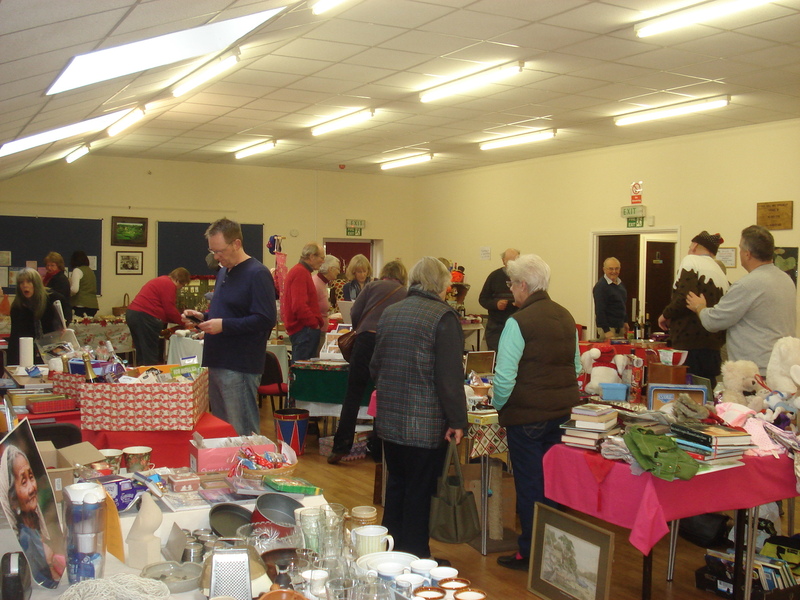 Yesterday was the Xmas Bazaar at Buckland St Mary village hall and we were on duty with the bric a brac stall again. It’s surprising what people want to get rid of and give to us to sell, some really good stuff and some really not so good!! There were a couple of Xmas hats for sale, so I modelled one. I really thought these would sell but no luck, so I will save them for our Xmas singing at the old people’s homes. Father Christmas was there seeing all the little children in his grotto. 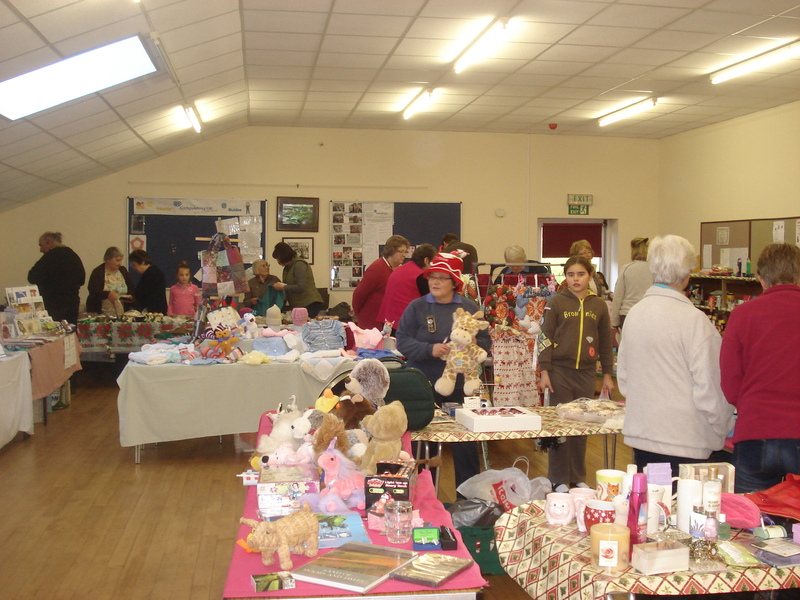 There were craft stalls and raffles, tombolas and cakes, all the normal stalls. Plus the usual afternoon tea service which always goes down well, especially with added cake!! We made £53.55 on our stall, not a great amount but £53.55 more than if we had stayed at home. Overall £850 was raised for everyday church funds so a worthwhile effort. The B&B is open now for bookings during December and Xmas. http://www.lodgehouse bandbsomerset.co.uk. a lovely old house with a beautiful lake in the back garden. 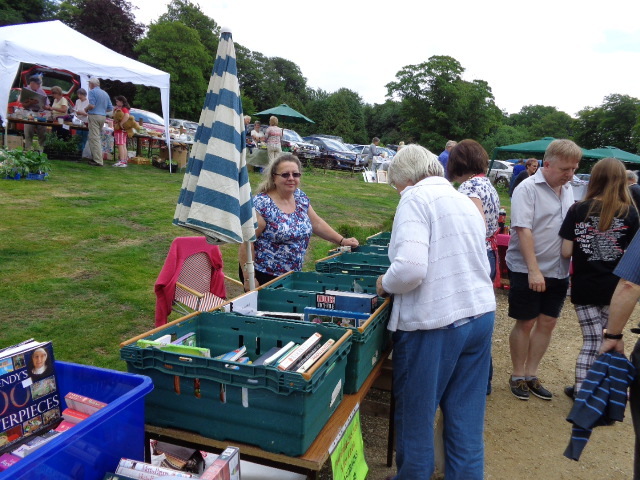 There were lots of stalls, the cake stall, the bottle tombola (Neil and I both won something), the coconut shy (Neil got a coconut first try), the book stall, skittles, bric a brac and ladies hats to name but a few, as well as the prerequisite burger stand and ice cream seller. The Wellington Silver Band were seated in the shade of a large tree and were playing when we went in. It was lovely to hear them and we stopped a while in the shade. Later in the afternoon Punch and Judy were appearing and a dog show was taking place in the field, with afternoon tea being served in the walled garden. How nice it would be to own a pile like that, and a wonderful setting for the Summer Church fete which is only held every 3 years. 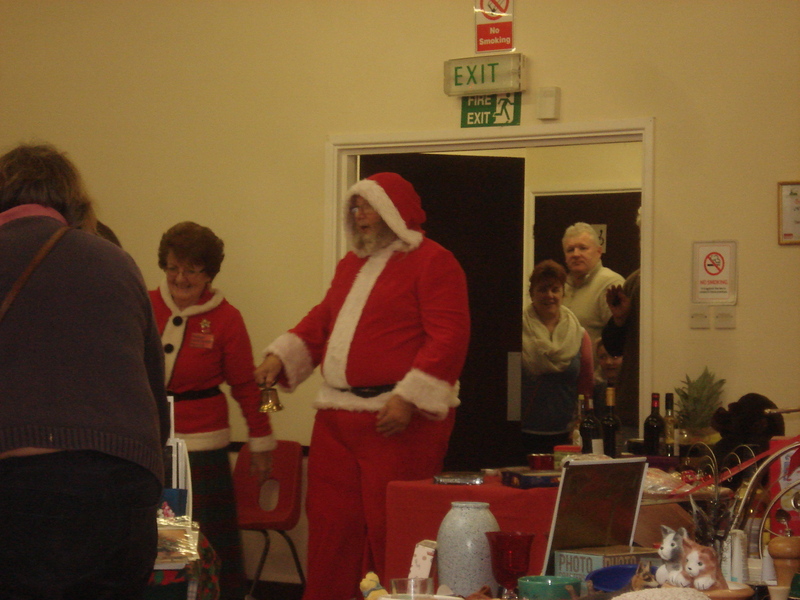 Twice a year Buckland St Mary holds fetes or bazaars – once in the Summer and once in the Winter and this weekend it was the turn of the Xmas fete held in the village hall. For the fifth year running Neil and I were on the Bric a Brac stall, basically trying to sell people other people’s junk!! Quite a hard sell!! I had also made some Xmas gift tags and lavender bags which I put on our stall to boost sales. We had a lot of soft toys to sell and I was amazed at how many little boys purchased them, then used them to beat up their friends! We managed to raise £51.57 in 2 hours so not too bad. It was quite well attended but perhaps not as busy as previous years, perhaps lots of people were out getting their Black Friday/weekend bargains. 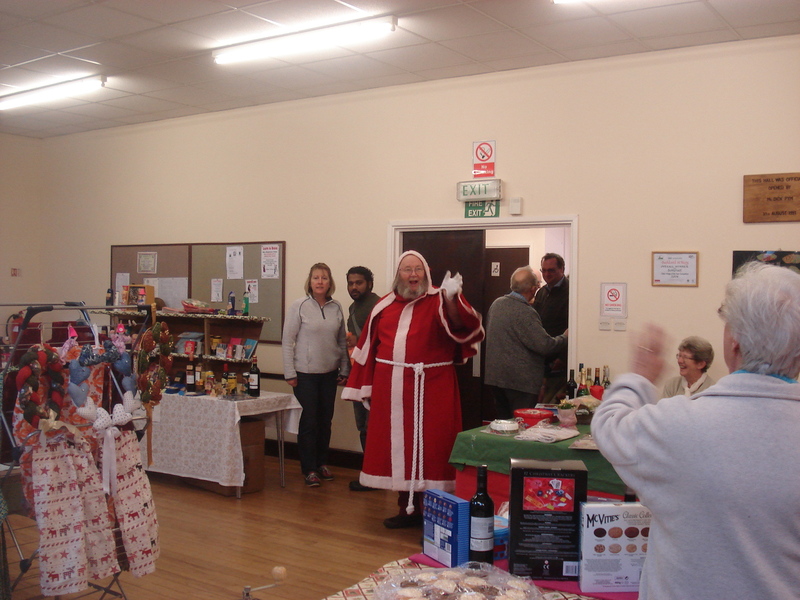 There were craft stalls, a card stall, a raffle and a hamper raffle, a tombola, a cake stall, a produce stall amongst others. And also there was Father Christmas in his grotto for the kiddies. The teas and cakes always go down well. I had a chocolate éclair with mine!! 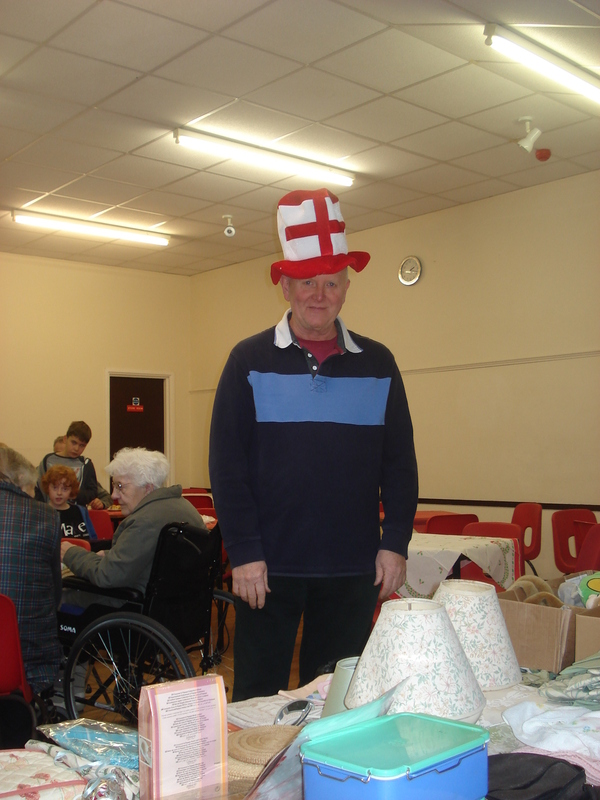 Neil was trying to sell a funny England hat all afternoon. This is our friend Mike modelling it. All fun and games in the country and fundraising into the process. 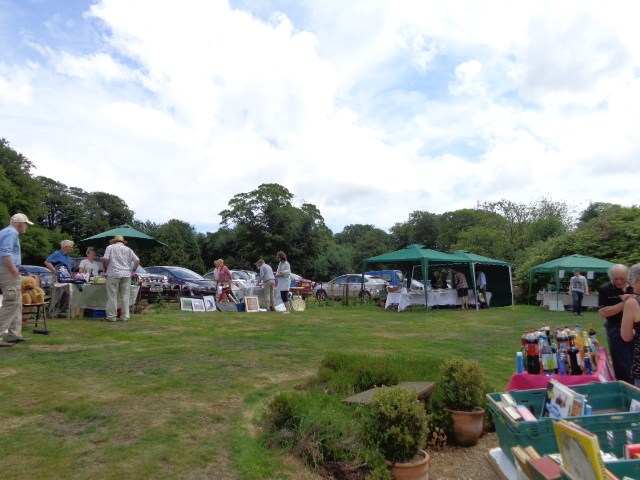 Yesterday afternoon was the Buckland St Mary church fete in the grounds of Buckland House. Once again we were running the book stall. We had so many donations of books we could hardly fit them in the car to take them down there, and we took 2 extra tables from home to display them on. This is me at the book stall. We did really well raising £80 which in these days of Kindles we reckon is very good. 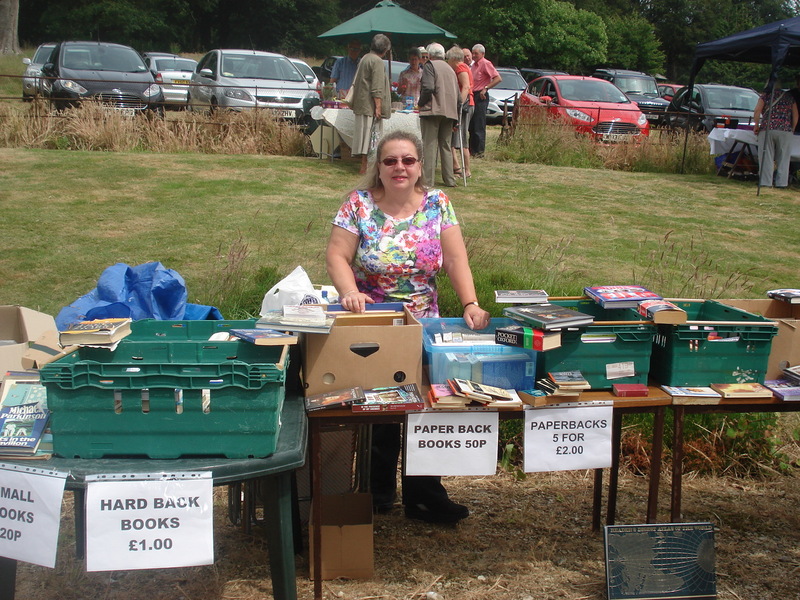 Our key selling point was 5 paper back books for £2.00. So if someone had 3 or 4 books, we would urge them to make it up to 5 to get a bargain. 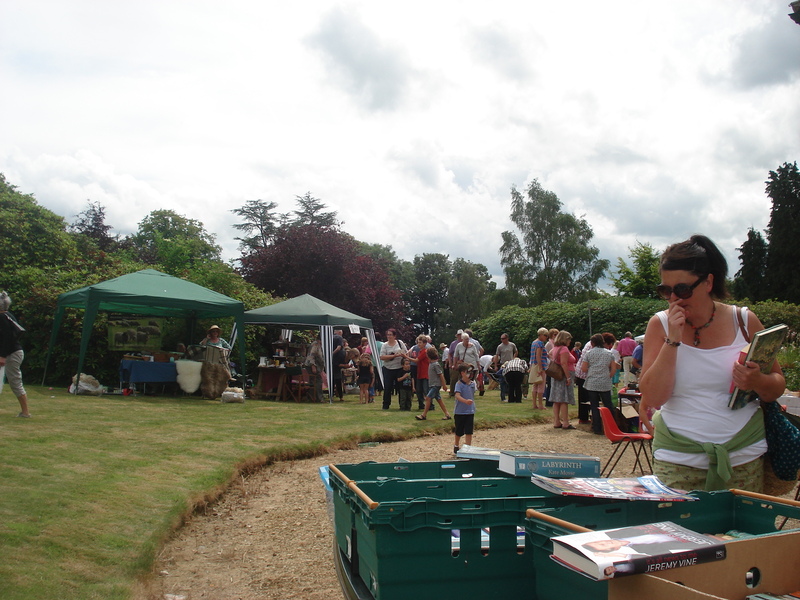 The fete was well attended and the sun came out in the afternoon which always encourages people to attend. 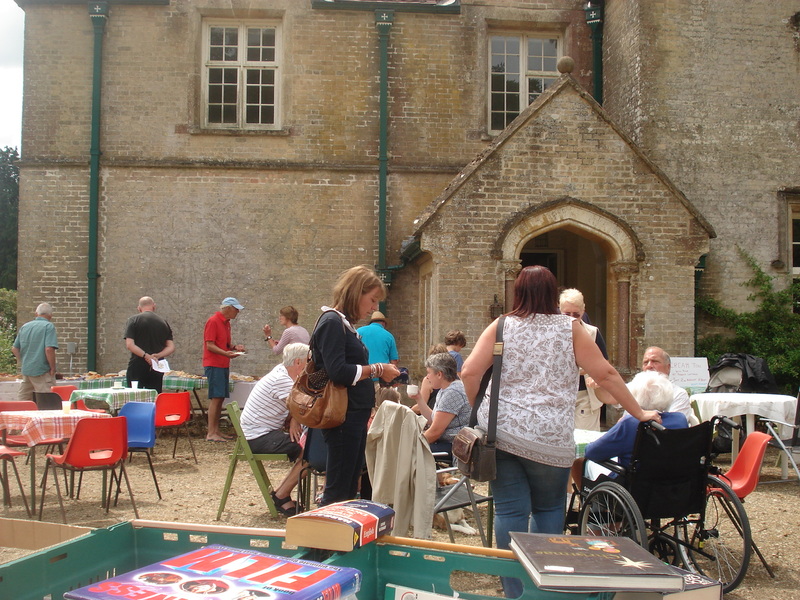 There were afternoon teas, a cake stall, a bottle tombola, a bric a brac stall, skittles, a plant stall and a stall with games like “The Cube” which proved popular, as well as other craft stalls. 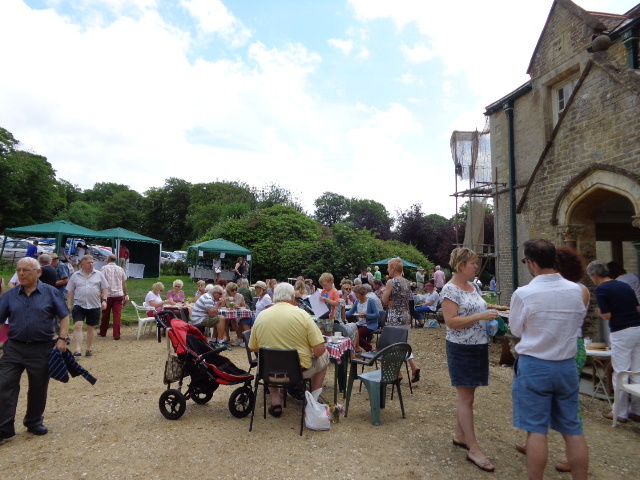 The fete is an annual event and the money raised goes to the church. It was lovely to see so many familiar faces and friends from the local area. The only problem was all the books left unsold which we had to take home and store in the garage. We shall take them little by little to Ferne Animal Sanctuary shop so they can sell them and get the proceeds. visit us at http://www.lodgehousebandbsomerset.co.uk – still some vacancies for July and August. 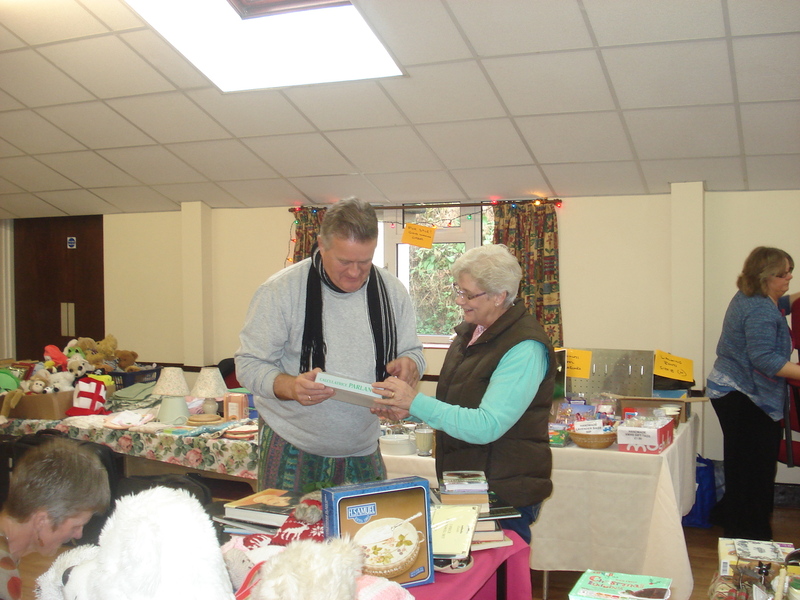 Saturday afternoon was the Buckland St Mary Xmas Bazaar. This is where Father Christmas puts in his first appearance of the season. Funny how he looked different to Father Christmas last year!! Think he had done something different with his beard!! 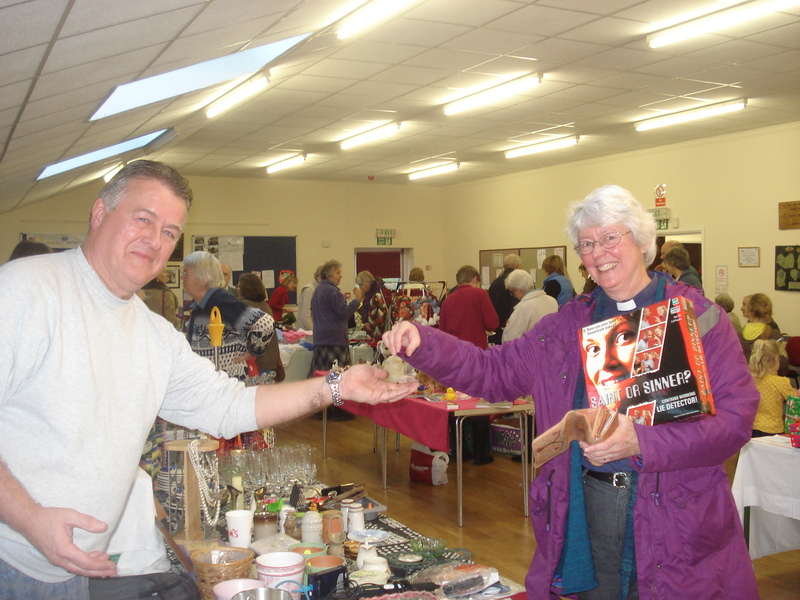 Neil and I were manning the Bric-a-Brac stall again. It’s not easy selling other people’s junk! Especially when you can only charge 50p or £1.00 per item generally. The most we took on a single item was £3.00. We made just £38.60, still it’s more than we would have made if we hadn’t turned out!! Neil delighted in trying to sell inappropriate items to our friends. 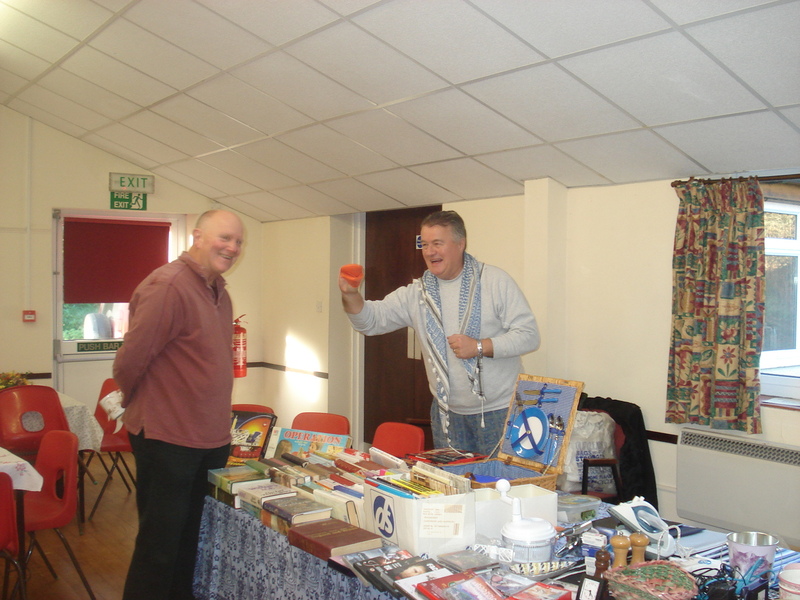 He even managed to sell a game called Saints and Sinners to the local parish priest. There was a good turnout of people and quite a few stalls. The teas and cakes always does well as does the produce stall and the cakes and pastries stall. 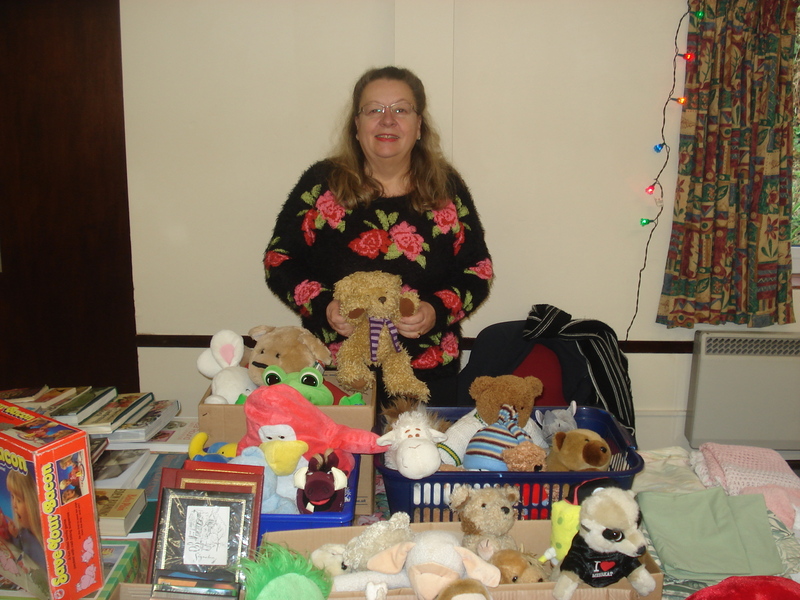 There were 2 raffles, a tombola, guess the name of the giraffe, greetings cards, jewellery and quite a few other stalls too. All in all a bit of fun. We then had to pack up all the left over stuff and now we need to take it to a local charity shop and hope they can sell the stuff we couldn’t sell! !